It’s the last day of August and, like the Sandhill cranes who’ve already hightailed it out of the Alaskan Interior, I’ll be flying south in a couple of days. When I return, Fairbanks will have morphed back into an arctic desert. Everything will be covered with snow and ice; the temperature, which was in the 20’s last night, will be way in the negatives; the sun will barely rise above the horizon; and the paper birch will have defoliated, dropped their old bark, and be completely masked by deep green, wispy spruce. 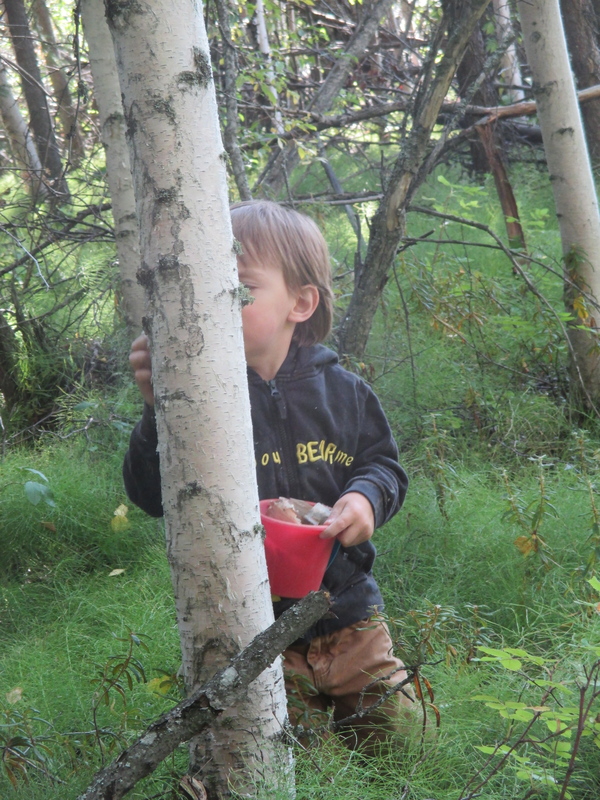 This sounded perfect to me because I’d been thinking about gathering some birch bark for making baskets and I thought r would adore pulling the old “paper” off trees in the backyard grove. Years ago, I’d woven a few pine needle baskets, my ultimate claim to fame being that I’d completed a basket during labor for each of my two children. (M’s was done during a grueling 24-hour Lamaze-athon and is about three times larger than D’s. It even sports a fancy lid.) 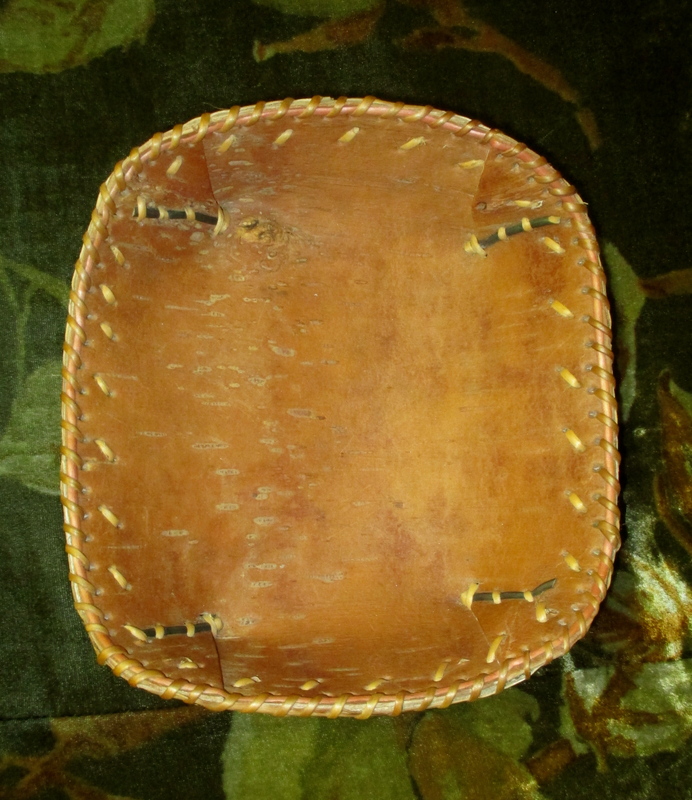 But there aren’t any pines, as far as I know, in Fairbanks and the spruce needles are too short for weaving. When I realized that here we’re completely surrounded by paper birch, it was a no-brainer. And then last week while perusing downtown Fairbanks for a wedding present, I stumbled across a couple of birch baskets by a local woman named Kate Wood who happened to be working the counter at the 2 Street Gallery. 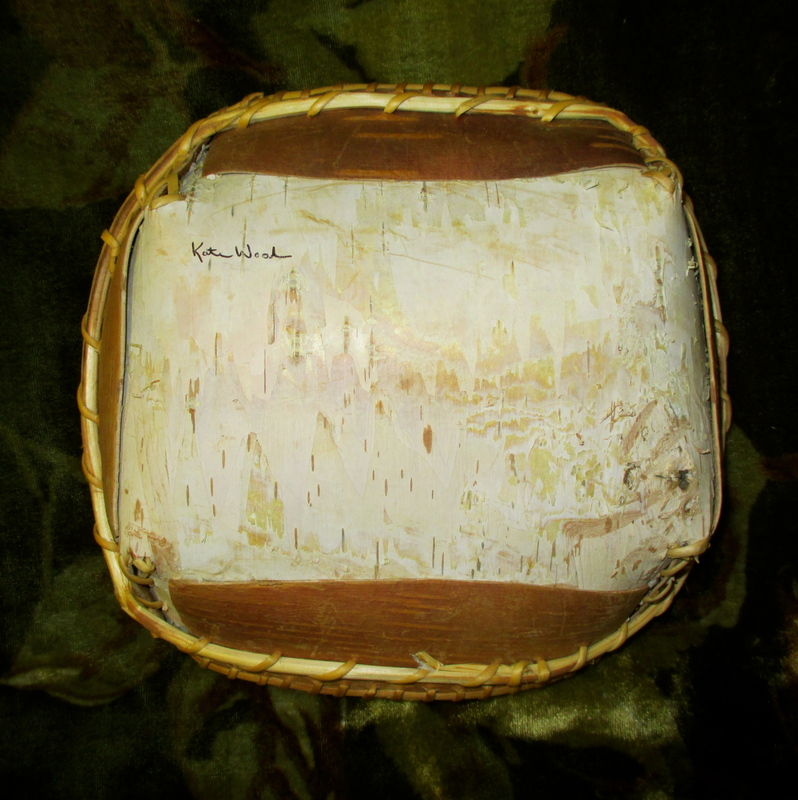 Kate uses local birch bark and spruce roots for her baskets and they are gorgeous. I went crazy and bought two (one for R and me and one for our newly hitched friends), plus a book Celebrating Birch, The Lore, Art, and Craft of an Ancient Tree. Kate was generous and, when I asked, said she might consider teaching a class on birch baskets and to check back when I return this winter. 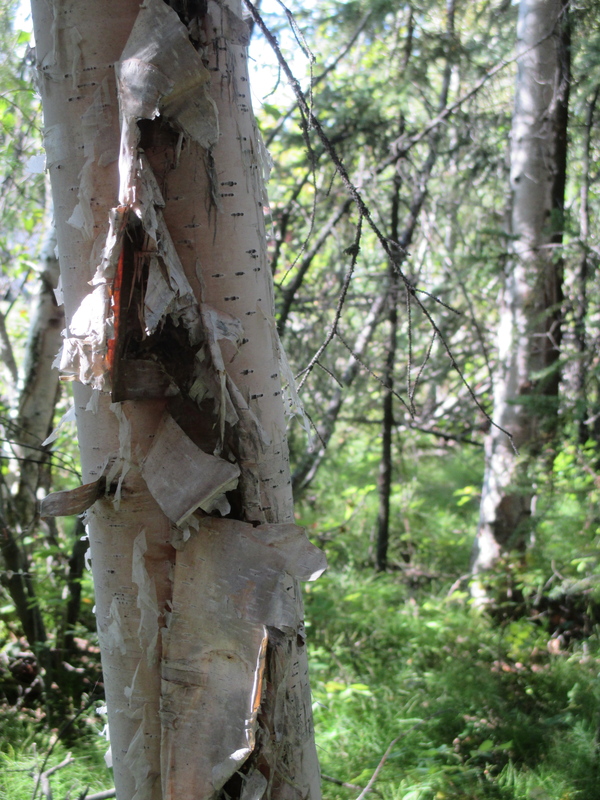 In the meantime, Celebrating Birch is rich with ideas if a person has a bit of bark. We harvested bark for an hour until our buckets were overflowing and somebody, not me, needed a nap. The last thing little r said before he closed his eyes was, “Gooma, I want to make a bark basket, too.” And he will, as soon as I figure it out … and I will. While r was sleeping, I looked through one of my Alaskan watercolor journals and found an entry made last December when I first noticed the delightful texture and pattern of birch bark. I think it was around the same time we discovered birch syrup and drizzled it over pancakes, ice cream and even in r’s milk and my coffee. Clearly, this ancient tree has bewitched us and we look forward to learning everything we can about it. Stay tuned. I just love these pieces—so sweet and elegant—tender and transporting–just beautiful—really think they’d be great in a children’s book–compiled or as part of a series. Thanks, jd. You know, it’s such a gift to be able to live some of the time in AK with my darling little r. I’ll think about your book ideas, especially since soon there will be another wee one, also a boy, with whom to share the mystery of Interior Alaska, and then even more stories to tell. 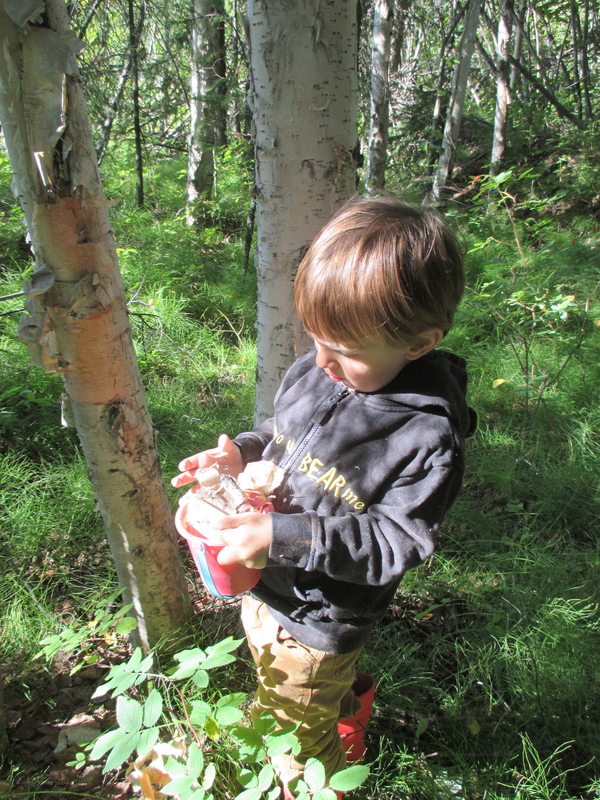 What about painting on birch bark? I love the way you take us into the woods. r feels like a family member, I can animate him in my mind! Welcome to our family, Katie! I love your idea of painting on bark. What medium would you use? Today, I met a woman who spent some time telling me some of the secrets of harvesting the bark, peeling the spruce roots (for stitching), using willow to shape the baskets, and how to add “skirts.” Looks like a door has been opened and I’ve already walked through. Hugs. Whatever transparent medium struck my fancy — but probably acrylic, as it might be hard to frame and then it would be permanent. I like JD’s idea for a children’s book . . . .
jd is a creative soul, like you, Katie. What a wonderful day with your grandson. Truly, Lisa, it was precious, like many of your own with your grandchildren. We are so very lucky! Enjoyed the story and photos immensely. 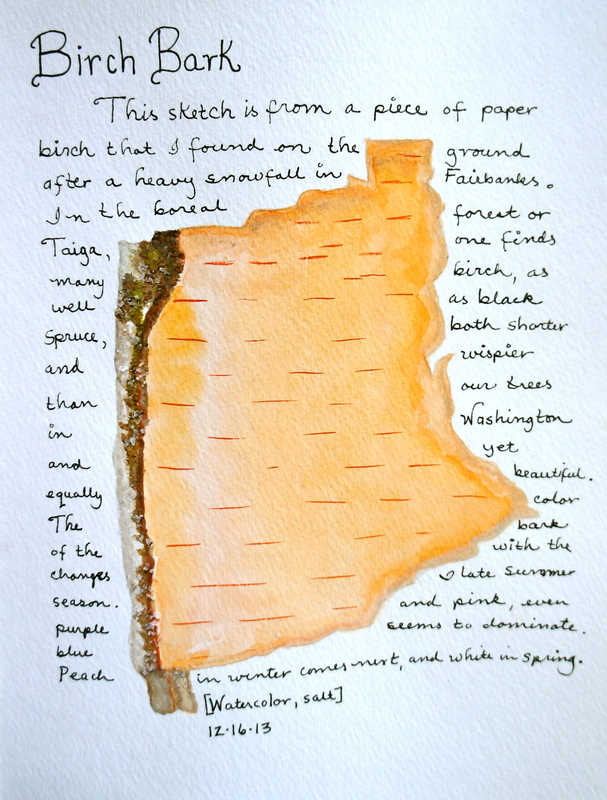 Especially liked the simple elegance of the birch bark sketch. What a tender post! Thanks so much, Susan! Delighted that you stopped by (and that we share a name). I’m enjoying your fine blog, as well. Hi Susan, I somehow missed this post, though I had thought you quiet for some time–I’m glad I checked in. I wonder have you returned to the cold of Fairbanks. What a wonderful experience it must be for a child such as Little r to grow up in Alaska and learn its ways–so much better than the ways of a large city, I’m sure. Thank you, Peter. Alaska is definitely a fine place for a child to grow up surrounded by nature and a total lack of pretension. 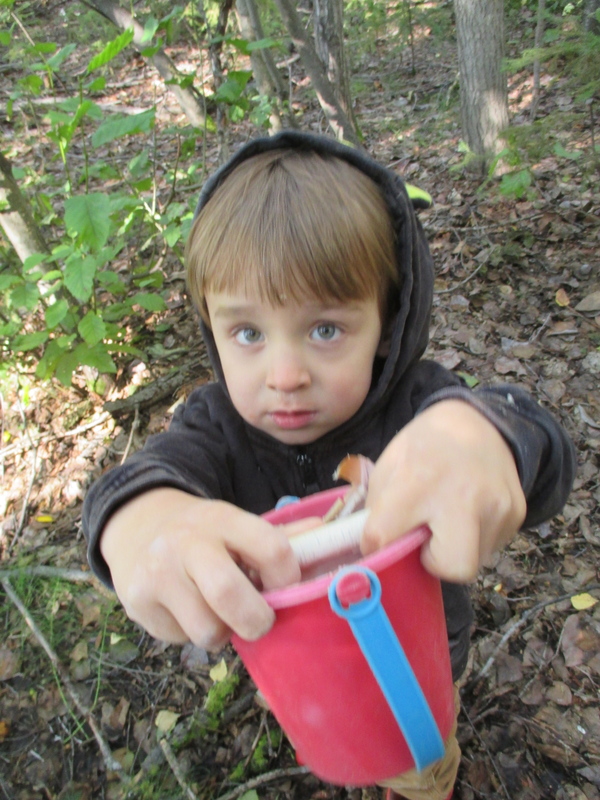 I’m so grateful to be able to wander through the forest with little r; he teaches me everything worth knowing. 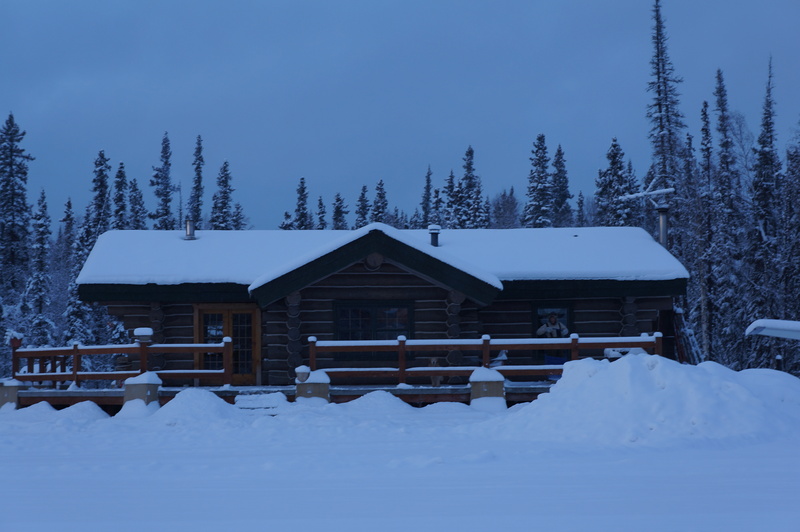 We’re in the Pacific Northwest, in Northwest Washington, for a couple of months and then it’s off to Fairbanks again, with winter sundogs, the exquisite aurora, and connecting with the cold, the GREAT, TERRIFYING COLD of Interior, AK. Yes, I took a wee break from blogging to do more hiking here, to work in the garden and to return to my novel and poetry, which have been whining in the middle of the night, poor things.